The theory of an aquatic phase in human prehistory was conceived by Sir Alister Hardy in 1930, when he was a young professor of marine biology at Oxford. He waited for thirty years before publishing an account of it, having a shrewd idea how it would be received and how it might damage his career. He was not aware that a similar idea had been published in Germany during the war by Professor Westenhofer but had sunk without trace. When Hardy published a brief account of it in the New Scientist in 1960 he was rebuked but subsequently forgiven by his colleagues and the suggestion lay dormant again for the following twelve years. In 1972 I revived the idea in a book The Descent of Woman. It had a basically feminist theme, highlighting how the popular versions of human evolution had been envisaged purely from the view of the male hunter. The book became a best seller on the strength of its readable style and political message, but received a frosty reception from the scientific world as the crackpot idea of a politically motivated television scriptwriter totally unqualified to hold opinions on scientific matters. 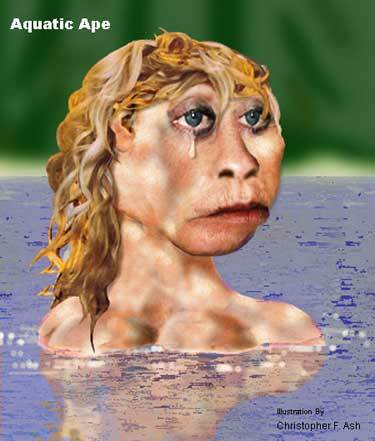 The argument for the Aquatic Ape Theory was based mainly on facts of comparative anatomy. Humans differ from apes in a surprising number of ways. The features distinguishing them are far more varied than the features dividing other pairs of species which are so closely genetically related. This suggests that the split with the apes was either occasioned by, or closely followed by, a drastic change in habitat and way of life. Many of the unique human features remain unexplained in terms of the orthodox paradigm, so that 150 years after Darwin there is still no agreed explanation of why we are bipedal or why we lost our body hair or why we have such fat babies, or why we can speak while apes cannot. AAT noted that some of these features, while unique among land mammals, could be readily found among mammals which had returned to an aquatic mode of life. Many aquatic mammals are naked, and their body hair has been replaced by a layer of fat closely adhering to the skin – as found in Homo sapiens. If the first stages of an aquatic phase had entailed wading, it could explain bipedalism. The one factor which causes all primates to adopt bipedal locomotion is the necessity of crossing a stream or entering water in search of food. The capacity for voluntary breath-holding which was a pre-requisite for speech, and is not shared with any other primate, is obligatory for diving birds and mammals. Thirty years is sometimes advanced as the time it takes for a really new idea to be taken seriously – time for the shock to wear off, and time for some people who were young and receptive when it was first mooted to attain positions of authority. It took thirty years in the case of Wegener’s continental drift theory, and Dart’s identification of the Taung child, and Mendel’s theory of inheritance, before they were admitted to the mainstream of scientific debate. This year is the thirtieth anniversary of the publication of The Descent of Woman, and there have been signs that AAT is beginning to come in from the cold. It usually takes a piece of luck as well as some tenable ideas to break the deadlock. In Wegener’s case the chief counter-argument was that there was no conceivable mechanism by which a continent could move. Once such a mechanism was discovered, then all of Wegener’s arguments were re-examined and made brilliant sense. In Dart’s case, the leading expert Sir Arthur Keith had declared after scrutinising pictures of the Taung skull that it was obviously that of a chimpanzee. Many years later he held it in his hands, and instantly declared “I was wrong.” The obstacle in Mendel’s case was that nobody expected a world-shaking discovery from a middle-European monk working in isolation, and when he published his paper it was not read by anybody capable of understanding its significance. Thirty years later it was rediscovered and its importance recognised by three scientists in three different countries within a short space of time. In the case of AAT, progress was very slow. I kept writing books about human evolution at intervals – five in all – and there was successively less criticism of my credentials and of the quality of the evidence and the arguments. Some useful new facts came to light, such as the phenomenon of swimming babies, and new insights into the importance for brain growth of dietary elements found primarily in the sea food chain. But for a long time the conviction remained that there was no call for a new theory. The savannah explained everything. Then suddenly it began to emerge, from the examination and dating of other organisms and fossilised pollen grains from the sites where the early hominids had been discovered, that the places in which they lived had not been savannah at the time. The savannah only became established millions of years after our ancestors became bipedal. That is now accepted as part of the conventional wisdom but has led to very little in the way of new thinking. Overheating of human ancestors chasing game on the grassland is still among the front-runners as an explanation of bipedalism and hair loss. It is true that one tv documentary on the “Search for the First Human” suggested that perhaps the hominids became bipedal while still living in the trees. (It would have been a dangerous time for the toddlers.) But the general policy is to play down the change in thinking as nothing more than a slight readjustment I.e. the size of the spaces in between the trees was somewhat smaller than previously imagined. However, the savannah paradigm has lost much of its authority. One of its strongest proponents in the past, Professor Phillip Tobias, publicly declared that those who based their thinking on it had been on the wrong track, and new thinking was called for. Dan Dennett wondered why the people who reject AAT out of hand never give their reasons for thinking it untenable. Some of the leading universities including Oxford, Cambridge, and Harvard have allowed me to give presentations on the subject of AAT. Pictures occasionally appear representing hominids on the edge of the water instead of in the middle of the plain, and science has welcomed the idea that at least by the time of Homo erectus some of our ancestors must have been shore-dwellers and made their way to the far east by following the coastlines. The reviews of my last book were guarded but this time not dismissive. The professional journals maintain almost unbroken their policy of avoiding any mention of the aquatic hypothesis, but on the whole I have come to find that silence reassuring. If AAT ever ceased to be regarded as beyond the pale, 99% of anthropologists would be able to say “Personally, I always felt it had a lot going for it,” and no one would be able to contradict them. The fact that nobody will listen to you does not mean you are necessarily wrong. But it doesn’t mean you are necessarily right either. It is advisable to be more patient with your opponents than they are with you. Even if you are right, you will need a lot of persistence, a very thick skin, and a fair share of luck. You should also watch your diet and take regular exercise, because if you ever hope to be welcomed into the scientific fold, the chances are that you will need to stay alive for a very long time.